Welcome to 4 Seasons Gutter Services! 4 Seasons Gutter Services has proudly served the Warren, Washington and Saratoga communities since 2010 by providing exceptional customer service for our invaluable clients. Locally owned and operated, 4 Seasons Gutter Service is a full-service gutter and water management company. The owner and staff combined have 17 years of professional water management experience and expertise. 4 Seasons Gutter Services takes care of residential customer and handles commercial clients within a 50-mile radius of Queensbury. We also offer senior discounts, military discounts, and discounts for non-profit organizations. We are open Monday through Friday from 9:00 a.m. until 6:00 p.m. We are closed Saturday and Sunday. All phone calls will be answered immediately or if not, in a timely fashion and someone will schedule for a free estimate at the customers convenience. Rain gutters are an important part of the roofing system. Redirecting the water off the roof reduces the erosion of soil at the base of the building, which can lead to wet basement walls, mold and weaken the foundation over time. A faulty gutter system can also contribute to damage to Soffit, Fascia, Shingles, Landscaping, Sidewalks and Driveway. Winter ice build up can damage your roof and create a safety hazard on sidewalks and driveways. 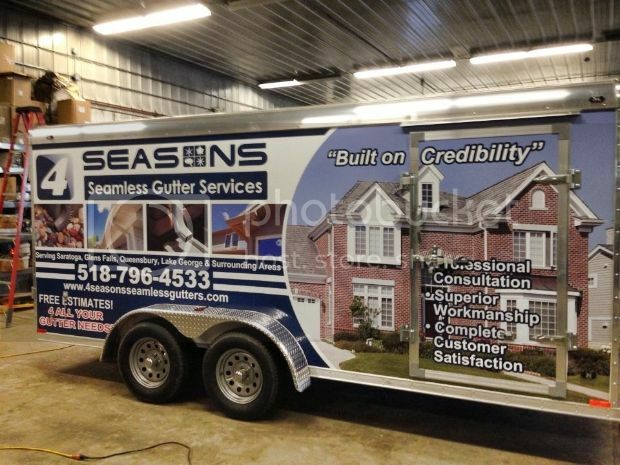 4 Seasons Gutters is dedicated to providing professional consultation, superior workmanship, and complete customer satisfaction regardless of the size of the project. Our qualified professionals will take the time to suggest, install and maintain you gutters to fit your needs and budget. A smart investment in quality gutters today could save you thousands of dollars in repairs in the future. We use .032 gauge aluminum gutter and attach our gutters using heavy duty hidden hangers. We use a spacing distance of 16" to insure maximum support. Our work is backed by a 10 year workman’s guarantee as well as a 20 year material guarantee. We strive for a "zero call back" satisfaction rate. We are professional, clean, and only use state of the art equipment. We have a wide variety of stock colors and can match as many as 36 different colors! We can accommodate both 5 and 6 inch gutters depending on our customer's needs. We now Specialize in 6" Commercial Gutters! The Gutters on your home can only work properly when they are unobstructed. There are several choices for natural obstructions prevention. We will suggest and professionally install the best solution for your specific needs. Sometimes, the best solution is a "Good old fashion cleaning". Ask us about being put on our yearly maintenance plan! Let us help you decide the best solution for you home. For more information, you can contact us at 518-796-4533. You also can visit our website, or like us on Facebook. You can even email us at: general4374@gmail.com. Although we are headquartered in Queensbury, we also service: Saratoga, Ballston Spa, Clifton Park, Glens Falls and Lake George.